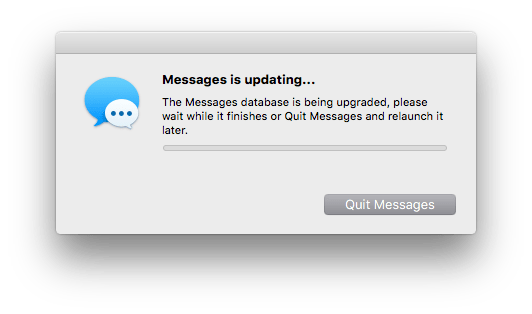 The Messages database is bring upgraded, please wait while it finishes or Quit Messages and relaunch it later. Searched my user Library > Messages folder for anything with Messages, iMessage, or iChat in the name and deleted it. After this, opening Messages brought it to the setup screen. I logged back in with my accounts and am now off to the races. While I don’t like that Messages imploded, at least it was fixable without major surgery.